The historic home of the pivotal political activist who led the Métis people in rebellion against the Canadian government. The Riel House in Winnipeg is a humble abode once inhabited by the Riels, a family of Métis origin, a Canadian ethnic group comprised of French and Canadian Aboriginal heritage. The house is most closely associated with the activist Louis Riel, who was executed in 1885 for his leading role in the North-West Rebellion, a bloody Métis uprising against the Canadian government. Louis Riel fled to Montana in exile following the Red River Rebellion, a Métis uprising that he led against the Canadian government for systematically seizing control of First Nation territories. Depleted bison populations caused widespread starvation as Canada’s indigenous and Métis communities were rapidly losing their land to federal control and development. The government eventually established the small province of Manitoba for the Métis people, but that too was restricted by Canadian authority. Come the 1880s, conditions for the Métis and First Nation communities were no better—in fact, they faced more extreme peril as railroads, towns, and privately owned farms developed on their land. In 1884, Riel was urged back to Canada by Métis leaders. He drew up a petition stating Métis grievances and sent it to the first Canadian Prime Minister, John A. Macdonald. When his demands for legal representation and land rights were ignored, Riel organized a militia, which prompted a series of violent battles over a five-month period known as the North-West Rebellion. Federal forces triumphed over the insurgency by 1885, which led to the concrete establishment of Canadian law across Métis and First Nation lands, and Louis Riel’s execution by hanging. Riel’s body was returned to Riel House for two days before he was buried in Manitoba’s Saint-Boniface Basilica. Today, Riel House serves as a throwback to this tempestuous era in Canadian history, and provides insight into the Métis way of life. The Riel House remained in the family until it was designated a National Historic Site in 1968, upon which it was taken over and restored by Parks Canada with the Winnipeg Historical Society. Today, visitors will find the house presented as it would have looked in the spring of 1886, in the wake of Louis Riel’s death. The Riel House is open to the public between July 1 and Labor Day, from 10 a.m. to 5 p.m. The house is a 20-minute drive from downtown Winnipeg. 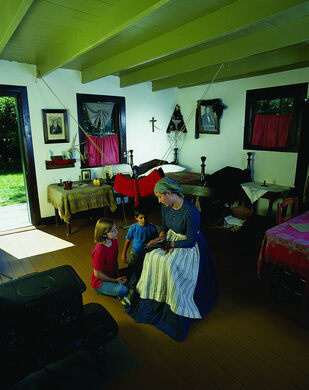 Visitors should plan to spend one to two hours at Riel House for the full experience.